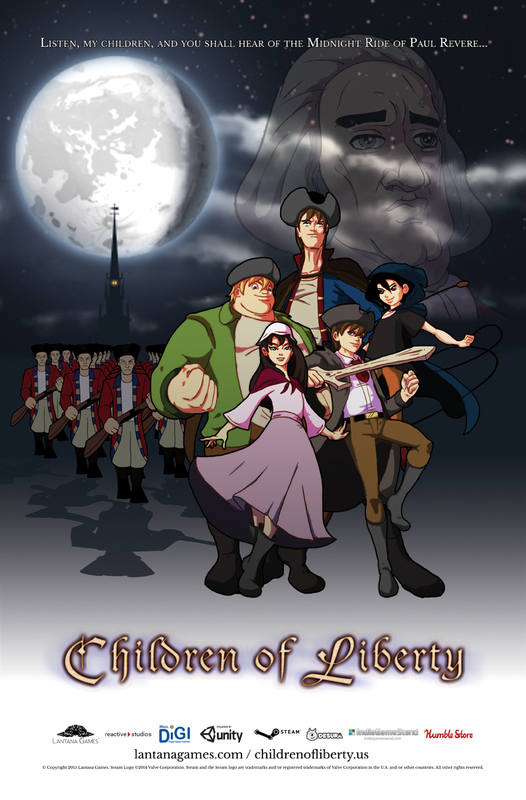 Children of Liberty is a stealth-action historical adventure that follows four kids spies of the Patriots on the eve of the American Revolution. It is being built in Unity 2018 for PC, Mac, and Linux. Greetings, Patriots! It’s time again for our quarterly State of the Game update. It’s been an unexpectedly busy Winter, with a few really awesome surprises along the way. The most important of which is that Children of Liberty has officially been upgraded into Unity 2018! While normally an engine update like this is risky for any product, for us it was a smooth-sailing and necessary endeavor. Unity 4 was released in 2012, and Unity 2018 is due to hit Version 1 very soon. This means the engine is much more up-to-date with the latest code & graphics libraries, streamlined development features, and greater cross-platform compatibility. Upgrading the game has already opened up development in some big ways, and the more we dig into what we can do with it, the more expedited everything is becoming. Here’s just a brief rundown of what we’ve been up to. 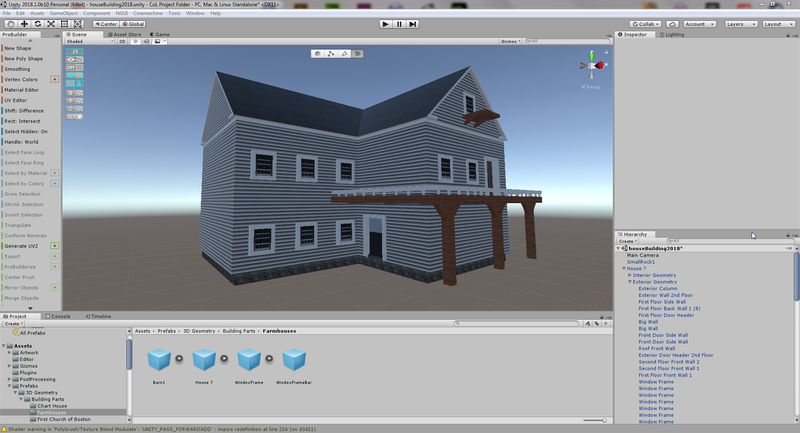 Unity officially integrated the 3rd party building tools ProBuilder, ProGrids, and Polybrush. We’ve had ProBuilder and ProGrids licenses for a long time; Brian had also been looking into Polybrush (or a DIY alternative) to automate some (but not all) geometry placement. Luckily, Unity3D hired ProCore and is making all of these crucial tools available to ALL users via the free license! We’re excited to get Polybrush for free (and to not have to DIY it), as well as knowing that our core tools will receive more updates and official support. 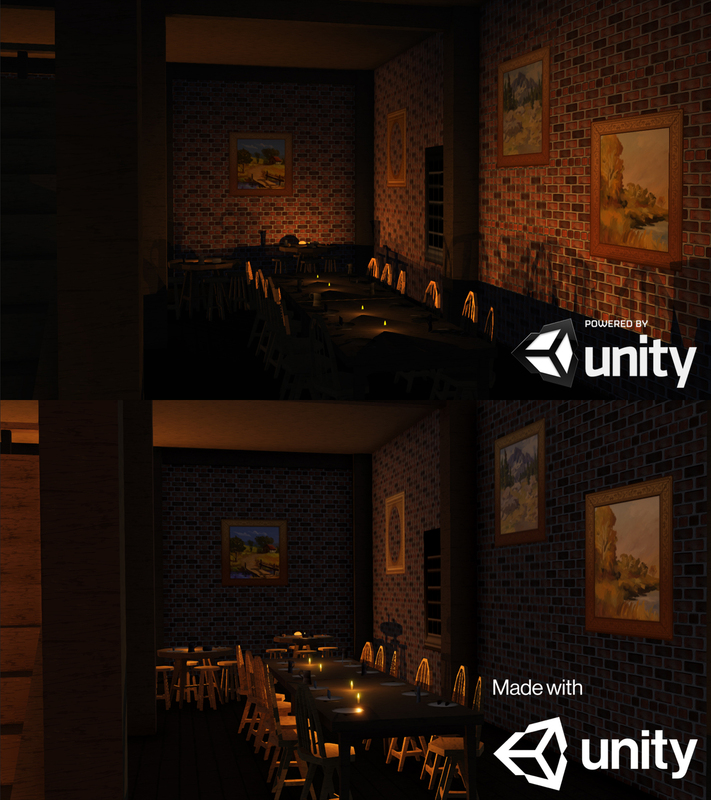 Unity 2018’s built-in shaders are much more robust and plentiful compared to Unity 4, saving us a lot of time that would’ve otherwise been spent researching issues we had with the old ones (and perhaps even saved money that might’ve been spent on a solution). It’s been trivial to swap over to the new ones; a lot of assets instantly got a lot better-looking (especially transparent stuff). We still need to do a lot of research and experimentation with the new shaders, and we’ll probably still have to take time to implement a custom shader solution for something somewhere, but we’re very relieved that we certainly have a lot less to do now overall than before. Spherical skyboxes! No longer will you see corners in the distance. We only needed to make minor adjustments to our background textures to accomodate this new tech. The upgrade was spurred by the sudden availability of free Unity-backed ProCore tools in Unity 2018. The primary barrier to upgrading has always been maintaining the integrity of our level geometry through the entire upgrade process; in our older versions of ProCore, the upgrade process was potentially volatile, and we had some bugs that would’ve exacerbated those issues. Much to our delight, upgrading the geometry to the new version of ProCore this time turned out to be quick and painless! There were no other significant barriers to upgrading, so Brian was able to make it happen in only four days. Overall, it’s been a very worthwhile endeavor. We’re going to take our time researching and experimenting with all of the new stuff, and we’ll keep you posted on our progress here and on Twitter. There’s a lot to be excited about here! Our creative team saw a great boost during the Winter with the addition of Samantha on Animation and Ilayda on Static Assets. 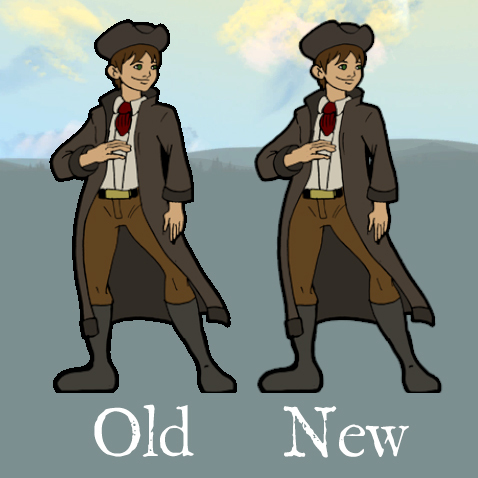 Samantha has been focused on NPC animations, completing work on Benjamin Church, while Ilayda has been busy creating all manner of new sprites, textures, and background paintings for the game. Meanwhile, Christine and Madison have continued with more fantastic additions, also on both the static and animated fronts. Christine has been working on some excellent surface material textures, such as stone, brick, and old wood; while Madison has been working on special effects like explosions, earthquakes, and particle effects. Everything is coming out great! The Creative Team is going to have quite a few new additions this Summer, so get ready to see a lot of new stuff. Since the engine has been upgraded, the time is ripe to upgrade everything else too, including the geometry. Brian ordered a quality pass on all geometry, meant to identify ways that Brian and his coders can automate fixing, creating, and implementing geometry, to finally eradicate some sticky long-standing issues, and to help us define a more rigorous process for building stable geometry that combines everything we’ve learned about it over the last eight years. All of that will be aided by new 3rd party tools that Brian’s researching; he’s going to have to make a couple of those tools himself, but they’ll save a lot of time with object placement and with implementing updates across all of our geometry (there’s a lot of it!). On top of this, the addition of Polybrush has helped speed up the release date significantly. With a little more R&D, we can start building levels much faster and much more cleanly. In the meantime, new art assets are still being steadily added and implemented. This department’s looking great, and the next phase in the cycle is going to be very exciting! With graduation looming, Stephen had to step away from the project to focus on his studies at SCAD, however, not before finishing all voiceover cleanup! That’s right, all 3-hours-ish of VO is now cleaned up & ready to be implemented into the game, a major milestone that we could not have surpassed without his help. Thank you Stephen for your hard work and great contributions to the project! Again, it’s time to upgrade everything, and that includes management workflows behind the scenes; many departments got easier to manage this winter, but especially Human Resources. After having handled so many interns from so many different schools, we have a very clear picture of how to hold up our end of the bargain with our partnered schools and with our students in every department. Our most-used documentation has been greatly refined, and our hiring and onboarding processes are now much more organized, concise, and comprehensive than before. These upgrades help us avoid mistakes as we continue to steadily scale up our hiring, and they save us a lot of time and energy in communication, tutorialization, and putting out small fires. Upgrading efficiency here (and in managing other departments), with better template tasks and documentation, gives us all more time to work on the actual game. This Summer, we are bringing on lots of new additions to the Tech, Creative, and Level Building teams. For tech, we have two talented Programmers from Northeastern; for Creative, 2D artists AND writers from Northeastern, Lesley, University of Texas, and Louisiana State; and on Level Building, we have builders from Northeastern and Mt. Ida. Of course, Christine, Madison, Ilayda, and Samantha are all still on board as well, so we are going to be a well-oiled and productive machine starting next month! As you can see, there’s a lot going on. I didn’t even touch on Mondrian here. For now I’ll just say PAX was great and stay tuned for a recap video! As for Children of Liberty, things are flying, and we’ve never been more excited about how the project is progressing or looking. We’ll be back with a Summer recap for the next quarterly update. In the meantime, don’t forget to head to our Support Us page & grab a game, t-shirt, or even donate to help us keep making games and mentoring the next generation of developers. As always, thank you for your support and for playing! See you in the next update. Want your artwork to be featured in the game as a collectible item? Find out how! Children of Liberty has launched on Early Access! The long in-development stealth game has exploded back onto early access, and more consistent updates are on the way. We take a look back at the history of Children of Liberty, and the changes to its mechanics, aesthetics, and narrative. It's been too long a wait. Finally, the new build of Children of Liberty is ready! I like games where you can play as a kid in a more serious matter. I'll def keep an eye on this project. Thanks! We're really excited about where it's heading and yeah, that whole young protagonist aspect has made for some really neat challenges in terms of narrative and gameplay. Are you planning on ever putting out an update here? Soon! We're crunching like crazy but don't want to put out anything broken or what could be perceived as a "downdate." 0.4.2 very soon! Stay tuned for our upcoming BostonFIG update. I heard about this game somewhere, I guess I'll have to check it out. Do i need unity to play the game? 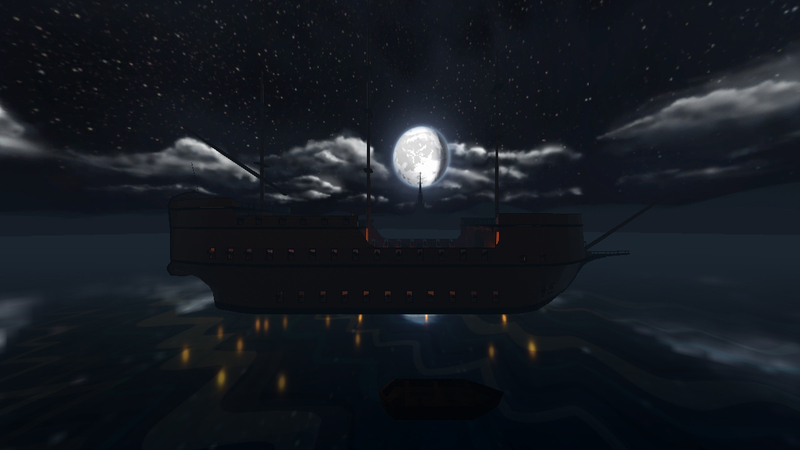 The version available on Desura does not need Unity to play. It is a standalone executable for both PC and Mac. Only the demo on our website needs the Unity Web Player to play.